I have been hard at work on this project for many months and I am very excited to share that my new eBook has been published. in html, ePub, Kindle, PDF, RTF, LRF, PDB. Kindle version also available on Amazon. The eBook is a pedagogical resource for any educator seeking a more human connection in their online classes. 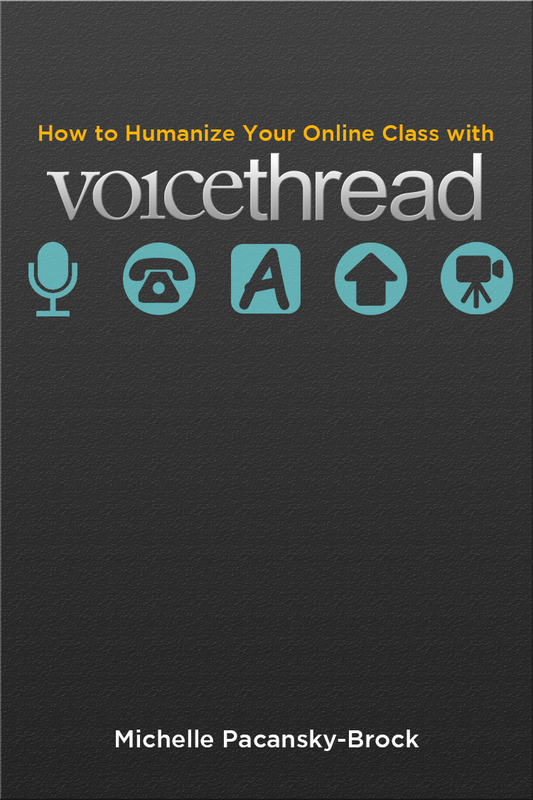 The contents are a compilation of years of my teaching practices and research from using VoiceThread in my own online classes. For me, my experiences using VoiceThread have brought me closer to my students and taught me many valuable lessons about inclusive instructional design and the importance of providing students with options to express themselves through voice or video. These are some of the lessons I reflect on in the book. While this eBook is offered as a professional development resource for educators, it's also a reflection of my own (continuing) journey as a lifelong learner as a teacher. The eBook is intended to fill an important gap by serving as a pedagogical support resource to faculty who may understand how to use VoiceThread, yet feel challenged about how to use it to effectively support the learning needs of diverse students. This issue underscores a growing problem in education today. There is an increasing demand to provide pedagogical resources for faculty to teach effectively with emerging technologies. This is a problem that affects students, faculty, institutions, and the emerging start up companies themselves who are striving to cater to the educational marketplace. New approaches to providing pedagogical support resources are needed. Creating resources to support effective teaching with emerging tools through institutional faculty development programs is not only redundant but unsustainable in our dire budgetary times. This problem demands a community-powered solution. And I believe faculty authored, self-published eBooks (like this one) could be a pretty exciting solution. The eBook includes an introduction (which you may read for free), four chapters, and a "Final Thoughts" conclusion. Throughout the eBook, the reader finds "Dig Deeper" sections that offer more than 20 links to video excerpts from my own VoiceThreads and sample VoiceThreads. These links serve as illustrations of practices in action to help illustrate the concepts described in the text. 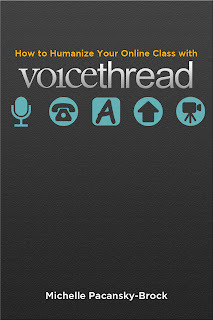 While the book is not a resource about how to use VoiceThread, there are links interspersed in the text that direct the reader to the VoiceThread site to learn how to perform basic function with VoiceThread (creating, commenting, groups/sharing, etc.). This chapter includes an examination of the topic of social presence and the significant value it brings to both community building and improving learning in online classes. The chapter looks at recent research that validates the benefits of asynchronous voice and video in fostering social presence. The chapter also examines the use of VoiceThread as an effective tool for applying principles of Universal Design for Learning (UDL) in online course design and demystifies some of the confusing misconceptions about accessibility and 508 compliance by pointing out what needs to be captioned or transcribed in a VoiceThread (and explains how to do it, including how to add closed captions to videos you upload into a VoiceThread). The chapter ends with an overview of a proven strategy from one of my own research studies that demonstrates how I increased my online students' voluntary voice or video comments from 25% to 75%. This chapter recontextualizes learning from our formalized academic framework into everyday language, which is an important step for instructors who want to improve their teaching skills. We look at concepts like scaffolding and flow and apply them to Bloom's taxonomy. I share specific examples of how I used VoiceThread as a formative assessment tool to scaffold learning in a flipped classroom and share the student survey results from this experiment. Chapter 2 also examines the importance of encouraging 21st century students to become content creators, rather than consumers of information and examines how VoiceThread is effective for fostering this skill, as well. To lead students towards this skill, I suggest scaffolding students' own VoiceThread skills by developing them from beginners using the commenting feature to editors of VoiceThreads and then creators of their VoiceThreads. To demonstrate this process, I carefully explain in detail the steps of a student-edited VoiceThread project and a student-created VoiceThread project from my own class with links to examples includes and my own instructor reflections. This is a chapter that discusses the nuts n' bolts of how to put together a solid VoiceThread activity that communicates clear expectations, grading criteria, fosters consistent norms, directs students appropriately to where they should comment (when, how many times). I include further tips, illustrations of sample slides, and a video tutorial of a sample VoiceThread. One of the most valuable and important components of a learner's growth and development comes from the feedback she receives from a teacher. When a student is learning online and the feedback is delivered in a timely manner through warm voice or video, the results are greatly improved from text-based feedback. Students respond more favorably to voice/video feedback (this is tied back to the research in chapter one), as the nuance of the human voice results in less hurt feelings and the context of the message is better understood. This chapter guides you through some important mechanics about how to facilitate feedback effectively with VoiceThread using a system I have developed using VoiceThread's Identities and special "feedback" avatars plus the comment re-ordering featuring. I also discuss different approaches to leaving feedback for students, how to model norms through feedback, how to deliver micro-lectures through feedback, and more. All of these examples are illustrated with video excerpts to enhance your learning. I hope you find this book valuable. I hope it improves your ability to use VoiceThread as a valuable tool in your online classes and I hope your students find VoiceThread as empowering as mine have.